Humankind is designed to adapt through adversities, sorting out happiness from that. Mistakenly sometimes you pick sorrows instead of happiness, while sorrows are shown only to make you recognize your happiness. If your situation is untoward, you have to come out of it only step by step. Deriving only pleasure from the smallest things possible, is going to place all the necessary stepping stones for you to come out. So start deriving only pleasure henceforth. Remove all bars to pick only that. Such bars are mostly in your minds so some of you sometimes find very difficult to be without but every time you have to adapt into the new situation found. That is the game of life we play as humankind for finding our place of pleasure and it is not that difficult. 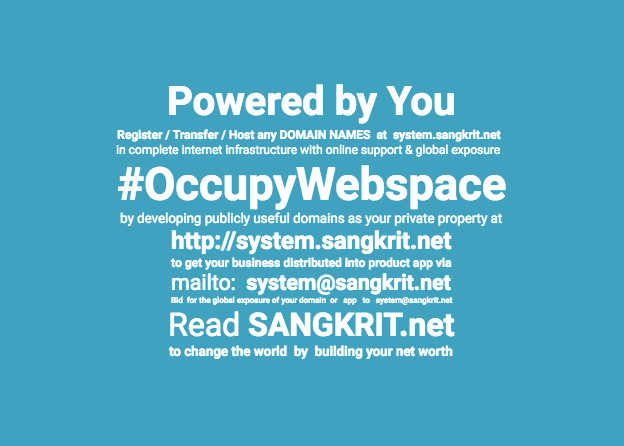 Sangkrit is such a new world awaiting your arrival within its folds. You have to come out of your untoward circumstances only step by step consolidating your own world of happiness by letting the unhappiness go away from your life. Happiness is the most promising pattern that could get configured basis the smallest things possible even through the most untoward circumstances.